SPOTIFY BREAKOUT INDIE ARTISTS YOU SHOULD FOLLOW PLAYLIST! CHECK IT OUT! Click Here! Audio Video Recording Michigan specialized in Artist Indie Music Marketing on Spotify, Google, Yahoo & Bing. 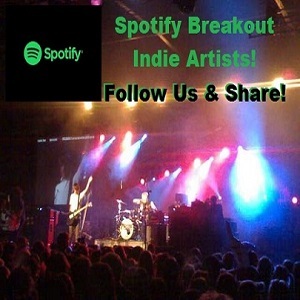 Our Breakout Indie Artists You Should Follow Spotify Playlist has over 12,000 followers! This is the most affordable way to orgainically grow your music. We don't use any fake bots for our plays so all listeners are real and true! Our Spotify Breakout Indie Artists You Should Follow promotion also offers you the opportunity to cross promote your music on various platforms according to your budget. When you see our rates and reviews you will find our service simply unbeatable at a pricepoint and also for the exposure you get. As artists ourselves it has always been our contention that most services which promote your music simply take advantage of you until you can no longer afford it. Likewise, the services they offer are much smoke and mirrors and hype. We are here for the artists. You can check out all of our music promotion services on Spotify (Click Here). Click Here To Join Our Spotify Breakout Indie Artist You Should Follow Playlist with over 12,000 Followers! Thanks for your Time and Consideration we look forward to working with you and take your dreams and goals seriously and look forward to working with you on a budget you and your band or Artist can afford!